As National Volunteer Week, April 23 – 29, comes to an end, Joshua’s Heart Foundation and its volunteers received recognition for the work they do locally and internationally from a Broward County commissioner and a U.S. congresswoman. Ileana Ros-Lehtinen, Congresswoman FL-District 27, who just announced her intent to retire this year from the U. S. Congress, Saturday April 22, presented 34 young volunteers with Certificates of Appreciation, while seven standout volunteers received Presidential Certificates of Service along with medals accompanying that award. In addition, she awarded a Certificate of Special Congressional Recognition to all the volunteers. Broward County Commissioner Dale V.C. Holness District 9, made a proclamation and declared April 25, Joshua Williams Day. He presented 25 volunteers with Certificates of Appreciation, while four standout volunteers received Presidential Certificates of Service along with the medals accompanying that award. Joshua’s Heart has been mentoring and motivating young people and their families to give of their time and treasure for more than 11 years. 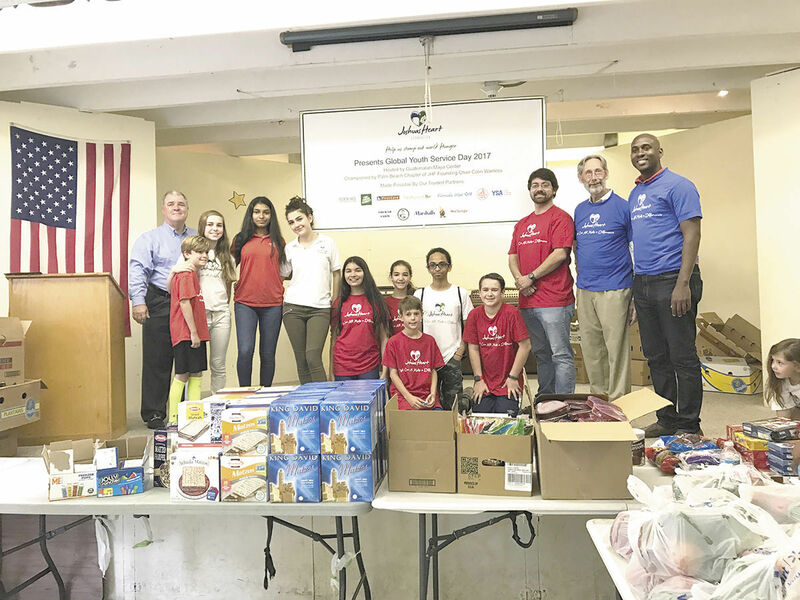 The young people have served more than 350,000 individuals and more than 1.3 million pounds of food have been distributed in South Florida, Jamaica, Africa and India. Every year, they choose to make a difference through philanthropy and several have now taken on individual projects in their schools and neighborhoods and others even in the land of their family ancestry. In its 10th year, one volunteer, Colin Wanless, opened and now champions the Boca Raton Chapter of Joshua’s Heart. This past Saturday, the Boca chapter distributed groceries, personal items, books and toys to more than 300 families in the City of Lake Worth as part of the foundation’s Global Youth Service Day initiative. For all their hard work, Lake Worth Mayor Pam Triolo, recognized the young volunteers, together with their sponsors and supporters, for their quest to eliminate hunger and poverty in the county. She made a Proclamation declaring April 29 as Global Youth Service Day in Lake Worth. Joshua’s Heart Foundation (JHF) was founded in 2005 in Miami, Joshua when he was just over 4 years old. It is dedicated to the fight against global hunger and poverty. It has two primary goals: to “Stomp out World Hunger” and to “Break the Cycle of Poverty.” A Junior Advisory Board consists of 80 young people ages 9-18, and 12,500 youth volunteers, who are known as elves.